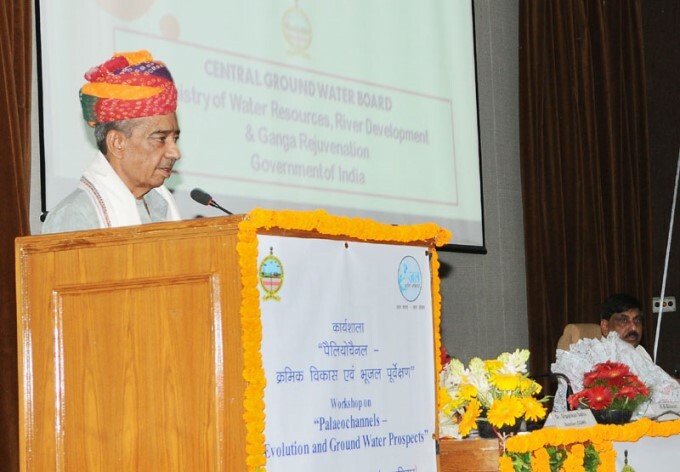 The Minister of State for Water Resources, River Development & Ganga Rejuvenation, Shri Sanwar Lal Jat addressing at the workshop on Palaeochannels :Geological Evolution and Ground Water Prospects in New Delhi on June 16, 2016. The Ministry of Water Resources (MoWR) organised a day long workshop on Palaeochannels – Evolution and ground Water Prospects to promote wide-ranging discussions on palaeochannels in India and collate available information and research outputs. The key organizer of the even was the Central Ground Water Board (CGWB), which is the principal agency under the Ministry of Water Resources, River Development and Ganga Rejuvenation for managing India’s ground water resource. The Workshop was inaugurated by Union Minister for State for Water Resources, River Development and Ganga Rejuvenation Prof. Sanwar Lal Jat, who highlighted that palaeochannels evoke interest in view of their geological and tectonic history, sediment domain and ground water prospects. Rivers, through the ages, have been lifeline of civilizations in the world and Indian subcontinent as well. Besides the existing flowing rivers with active floodplains, there are remnants of old rivers which are identifiable. These remnants are called palaeochannels and are characterized by relatively coarse soil, in comparison to their floodplains over the banks. Palaeochannels have always been intriguing to the researchers as to how the rivers migrate, disappear or get captured, leaving palaeochannels thereby. The palaeochannels reveal plethora of information about the history of the rivers, palaeoclimate, sedimentation process and the civilization along its banks, interwoven with its course and floodplains. Palaeochannels have been reported from different parts of India, covering the Indo-Gangetic plains as well as the central and peninsular India. Several ancient rivers now turned into Palaeochannels, which once supported civilization, agriculture and economic growth along its flood plains. Of all the reported palaeochannels, most widely researched, investigated and discussed are those located in the western and north-western parts of India, covering the states of Haryana, Rajasthan and Gujarat which is often linked to erstwhile mighty River Sarasvati. According to Prof. Sanwar Lal Jat, because of better flushing mechanism in the groundwater system of palaeochannels, coarser nature of sediments and fast recharge, the quality of groundwater in palaecohannels is often better than the surrounding environment. The Minister also informed that the palaeochannels of Late Quaternary (1- 0.5 million year) period are of particular interest from groundwater point of view. Optimum utilization of water resources therefore warrants detailed understanding of groundwater prospects of the palaeochannels. The workshop synthesized views, ideas, information through deliberations by pan-India experts, stakeholders etc. The focal points of the deliberations were geologic, climatic, tectonic reasons for disappearance of rivers, location, alignment and geometry of palaeochannels, sedimentological characteristics, ground water prospects and recharge potentials, and developing priorities for future investigation and research. This was the fourth such workshop by CGWB and the first three were organised in Ahmadabad (July 2015), Allahabad (October 2015) and Jodhpur (March 2016).